There's no question about it: a live performance by "Big Mama" Sue Kroninger will make your next event an extraordinary occasion that your guests or patrons will never forget. A songstress with a voice both elegant and powerful, she brings a lifetime of experience and a huge repertoire of songs to every one of her performances. Together with her band of topflight musicians, she serves up an entertaining musical experience that's as exciting as it is distinctive. There's more to getting great music than just hiring great musicians. After decades of success, Big Mama Sue Productions prides itself—above all else—on professionalism. Hosting even a small party or other event can be complex, and a potential breeding ground for serious headaches. With Big Mama Sue Productions you know up front precisely who you're dealing with, what type of musical presentation you'll be getting, what all your options are, and the exact cost. Most important, you can count on the performers being where they should be when they should be. Big Mama Sue stakes her reputation on it—and wouldn't have it any other way. Big Mama Sue Productions specializes in providing what could be described as, "popular American music from the first-half of the 20th century." This encompasses many flavors of jazz, blues, and other styles, including Dixieland jazz, sophisticated swing, low-down blues, songs from the "Tin Pan Alley," even traditional country and western favorites and songs from popular Broadway shows. While much of this music might be thought of as "something for mom & dad," Sue's polished, dynamic, fresh-and-friendly presentation ensures that it will be enjoyed by all ages. Big Mama Sue Productions delivers music with style, diversity and flexibility. This means we can provide live music for just about any venue: company parties, shopping malls, jazz festivals, wedding receptions, trade shows, county fairs, backyard Christmas parties—the list goes on and on. Sue is renowned for her ability to "work a room," and the musicians she brings with her are consummate professionals. Sue and her band can stay stylishly in the background, or move to the foreground with contagious doses of energy, enthusiasm and entertainment. Below you'll find more information on specific event-types. Read on and find out how you can have some of the best live music around at your next event. Live music from Big Mama Sue Productions can transform your special event from ordinary to extraordinary, from forgettable to fantastic! And here's the best part: we make you look good. With style, energy, and professionalism, Big Mama Sue and her band will keep your guests happy, entertained, smiling, and complimenting you on your uncommonly good taste. 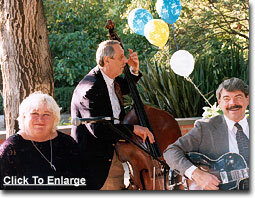 Big Mama Sue Productions offers live music for special events in the San Francisco Bay, Silicon Valley, and Monterey Bay areas. 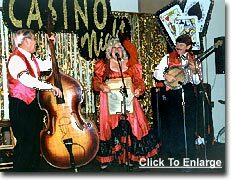 We can provide everything from a duo (Big Mama Sue with a pianist, guitarist, or banjo player), to an eight-piece Dixieland or swing band. Servicing both private parties and commercial establishments, the types of events for which we can provide music is almost unlimited (click here to see a list of some of the most common). We offer both stationary and mobile (or "strolling") band configurations. We can provide a sound system (we have a wide range of amplification equipment suitable for just about any size venue), or we can bring our own microphones and use your "house" system. Other than access to an electrical outlet, we need no special setups or considerations. To hear an audio sample of Big Mama Sue and her fellow musicians, visit our online music page. To order a demo tape, or for answers to any questions you might have, don't hesitate to contact us at inquiries@bigmamasue.com. Big Mama Sue is famous for her ample resources (musical resources, that is). With a vast repertoire of songs and a pool of some of the most outstanding musicians throughout the United States to draw from, she can easily fill a weekend with music, keeping every minute of every set fresh and polished. Below is information on specific types of weekend engagements for which Big Mama Sue Productions provides music. For all of these, if you are outside of central California, we ask that you provide transportation and lodging for each performer. You have the option of making these arrangements yourself, or you may compensate us and we will make the arrangements. We will also be happy to discuss audio and staging requirements with you. Big Mama Sue boasts almost three decades of jazz festival performances, with an amazing 150+ appearances at festivals around the world to her professional credit. She's appeared as both a headliner with her own group, and a featured member of other bands. Her style and personality make traditional jazz "standards" sound as her own, and she has a particular affinity for performing the music of the great jazz personalities—"Fats" Waller and Bessie Smith being notable favorites. In addition to her vocal talents, Sue expertly plays the washboard—a genuine Dixieland-jazz rhythm instrument, believe it or not. Dyed-in-the-wool traditional jazz fans recognize Sue's tune selection and vocal style as authentic and true, and the musicians she selects to work with as some of the world's finest in this genre. Casual jazz fans are drawn to Sue's performances because of her buoyant enthusiasm, and her willingness to make the crowd part of the show — something many less-experienced performers neglect. Jazz festival directors love working with Sue because of her professionalism, both on and off stage. In addition to the name recognition she adds to a festival program, Sue maintains an aggressive advertising program of her own through a traditional mailing list, a phone hot line, and Internet advertising. Sue has a large following of dedicated fans, and keeps them well informed of her public appearances—a definite plus when it comes to filling the seats wherever she performs. Big Mama Sue and her band offer two additional and important benefits: variety and versatility. Because Sue's bands are built around her, the groups she brings are usually trios and quartets—smaller, with a different sound than your average Dixieland band, but still 100% true to the style. And in the context of a small band size, Sue is able to liberally feature the talents of the all-star quality musicians who make up her ensembles. Add Sue's tremendous versatility, and the flexibility a smaller group provides—both in musical selection and volume control—and you have a headlining group that can be located in venues inappropriate for many other bands. Sue is as at-home in an intimate lounge as she is in a 10,000 seat amphitheater. If you'd like a demo tape or have any questions, please contact us at inquiries@bigmamasue.com. Also, make sure you check out the online performance calendar, and catch Sue at an upcoming festival—you'll be glad you did! With dozens of appearances as an entertainer to her credit, Big Mama Sue is no stranger to crafts and county fairs. Working at them as a performer was no accident however—she loves these down-home, all-American events, and often attends even when she's not working. Not every performer can survive in these types of busy, crowd-in-your-face arenas, but Big Mama Sue thrives on them. For fairs, Big Mama Sue Productions can provide both stage shows geared for adults and/or children, or small, "strolling" groups. With a distinct knowledge of traditional American music and a plethora of musical resources, Big Mama Sue is the perfect choice as a spotlighted performer. She combines her gregarious personality with the music of George M. Cohan, Louis Armstrong, Steven Foster, and other American musical greats, to put on a show that entire families can enjoy. Plus she brings with her a group of the finest high-energy, hard-driving musicians, who help wake up the crowd and cast an aura of excellence onto the fair and its patrons. Big Mama Sue also excels at working in the crowd as part of a duo or trio of strolling musicians—bringing the music to the people. Her substantial vocal prowess (her "big pipes," as she likes to call them) means she can play to small- to medium-sized crowds sans microphone. Sue also plays the washboard, a rhythmic musical curiosity like no other. 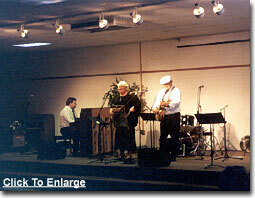 When performing in a duo configuration, Sue is often accompanied by noted banjo virtuoso "Fast" Eddie Erickson. Combining tight vocal harmonies with comedic showmanship, the two of them have a polished rapport that comes only with years of experience working together. If desired, a horn player can be added (either a tuba, trumpet or clarinet), increasing the visibility and sound-level of the group even further. NOTE: If your organization is putting on a fair with a seasonal theme, make sure you look at our Seasonal Entertainment section, below. If you'd like a demo tape or have any questions, please contact us at inquiries@bigmamasue.com. Also, make sure you check out the online performance calendar, and look for Sue and her band at an upcoming fair near you. We'll let you in on a little secret: Big Mama Sue hasn't always been exclusively a performer. For almost a decade she ran an event planning company in the Silicon Valley. Coordinating the entertainment, catering, decorations, personnel, even rentals of complex sets and props, were all in a day's work. While she has since sold her company to devote herself full-time to music, she has retained something that most entertainers don't have: an insider's knowledge of how to produce a successful theme party. She knows what goes on behind the scenes, what works and what doesn't at events big and small, and she brings that experience to the job when she's hired to perform. No matter what the motif, Big Mama Sue can put on a musical show that integrates tightly with your party's theme. In addition to performing an appropriate selection of music, Sue will lavishly attire herself in a costume befitting the affair. The musicians she brings with her will also be outfitted in appropriate costumes (though not as magnificent as Sue's of course—that would be an order too tall to fill!). Smart hosts, hostesses, and event coordinators may take advantage of her music planning expertise to make sure they get the most "bang for the buck," and avoid common pitfalls, to help ensure their event goes off without a hitch. Questions? Like to hire Big Mama Sue (and/or her musician associates)? Just contact us at inquiries@bigmamasue.com and tell us what you need. Our online music page has audio samples of Sue and her musical sidekicks, and we're also happy to supply a demo tape if requested. With a closet full of costumes and a song for every season, Big Mama Sue is an ideal addition to your Christmas, 4th of July, St. Patrick's Day, Mardi Gras, Easter, or other holiday event. Big Mama Sue is the consummate Mrs. Santa Claus at Christmastime. She knows dozens of Irish tunes for St. Patrick's Day (although she'll never be mistaken for a leprechaun in a police lineup). She'll raise goose bumps with her "God Bless America" on July 4th. And check out the most recent addition to the Costume Closet: Big Mama Bunny for Easter. These costumes were designed at the request of one of our major retail clients for their Children's Easter Fashion Show entertainment, and now they are available for everybody. Yes, we can custom design a theme or even a costume if the need arises. For all major holidays, Sue is available for private parties, holiday festivals, corporate parties, shopping malls and other business promotions, accompanied by one or more musicians who are appropriately costumed for the particular holiday. A wide variety of band configurations are available: strolling duos, jazz trios, New Orleans-style marching quartets, and more. And although Sue most often appears in costumes for seasonal performances, she doesn't have to; black tie, or coat-and-tie are always appropriate and available. Our online music page has several audio samples of Sue with various band configurations. For additional information or a demo tape, don't hesitate to contact us at inquiries@bigmamasue.com. You're probably asking the question, "how much will it cost to have Big Mama Sue appear at my special event?" Regretfully, it's impossible for us to answer that question on this website. Cost is determined by a number of factors, and is handled by Big Mama Sue Productions on a case-by-case basis. We'll be more than happy to give you a price quote though; all you have to do is send an e-mail to inquiries@bigmamasue.com with details of what you need. And don't be afraid to ask questions; Sue is happy to furnish her substantial expertise for the planning of the entertainment portion of your event. Please browse our website for more information on Sue and Big Mama Sue Productions. We've tried to make our site enjoyable and informative. If, however, you have a question that isn't answered here, don't hesitate to contact us. Fun With Big Mama Sue | See Big Mama Sue's Costume Closet!! !